Things to envy: 5,000-lumen projectors, a racked maxed-out dual-G5 with non-stock video cards, and a visual artist with years of experience building software for just this sort of thing. If you’re interested in doing the same thing, check out the Jitter tutorials. This is a feature I think you can expect in other software, too, particularly since several major VJ apps are built in Jitter. I’m also working on a simple tutorial patch that demonstrates how to do this in a little more detail than the Jitter docs provide; expect that early this summer. More software, also advocated here on CDM before: Vidvox GRID, and Apple’s Quartz Composer. Anyway, forget the terms: while this rig is certainly drool-worthy, I think it’s fantastic news that a lot of these tools are fairly accessible. (Jitter is pricey, though some of you already have it, GRID is cheap, Quartz Composer is included with Mac OS X in the developer tools, and Pd and Processing are both free alternatives to Jitter.) The more people working with these tools, the broader the definition of live visual performance will become, and that’s good for everyone as this medium tries to earn new respect. 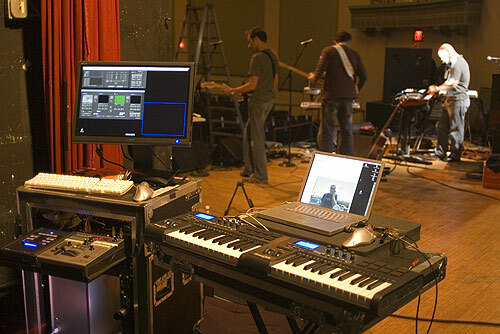 And musical expression can find a new multimedia venue with live digital visuals. Hey, it worked pretty well for opera. I expect we’ll hear more about this particular rig, as music maker M-Audio is now establishing Johnny as their first sponsored artist, much like Vidvox has done in the past. Stay tuned. There’s a lively discussion of open-source software solutions to many of these problems, particularly doing live visual performance, on the forums.